The Alchemy section is a listing of all alchemical ingredients found in the world of Tamriel. Each entry in this index provides a quick reference to the effects and appearance of ingredients in the games. For more information about the flora and fauna that most ingredients originate from, see their respective indices. TES: Arena: There are potions, but none can be made. TES II: Daggerfall: Potions can be made, but only with the aid of a Potion Maker. 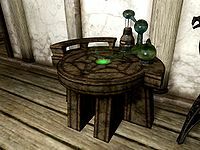 TES III: Morrowind: Potions can be made with the proper apparatus: mortar and pestles, alembics, retorts, and calcinators. TES IV: Oblivion: Potions and poisons can be made with the proper apparatus: mortar & pestles, alembics, retorts, and calcinators. TES V: Skyrim: Potions and poisons can be made, but only at an alchemy lab. TES Adventures: Redguard: Potions are sublimated with ingredients, though most combinations have no effect. TES Travels: Shadowkey: Consumables may be eaten or drank to provide an effect. The Elder Scrolls Online: Potions and poisons can be made, but only at an alchemist's lab. The Cake and the Diamond by Athyn Muendil — An alchemist tricks a thief! This page was last modified on 4 January 2019, at 21:23.